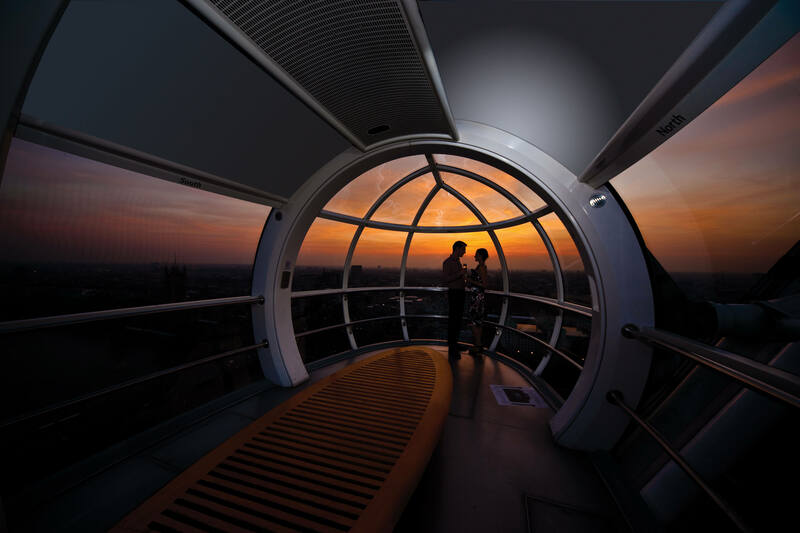 Enjoy unparalleled views across the city from the London Eye with an extra-special, luxurious touch. Sip a glass of chilled Pommery Brut Royal Champagne as you slowly make your ascent to the top of the eye, which has now become one of the most iconic symbols of modern London. Your Champagne Experience aboard the London Eye is accompanied with fast track entry, a personal London eye host who will be able to answer any questions you have during your 30-minute rotation, as well as a complimentary 360° mini guide, entry to 4D cinema experience and use of Samsung interactive in-capsule guides, so you can find out all about the view you see. Make sure you save up to 20% off when you book online, too – tickets for all this can cost as little as £31.50, bringing a little flair and luxury to the reach of all! Open daily 11:00 - 18:00 except Christmas Day (25 December). AT 135M, COCA-COLA LONDON EYE IS THE WORLD’S LARGEST CANTILEVERED OBSERVATION WHEEL, PROVIDING UP TO 40KM OF PANORAMIC VIEWS ON A CLEAR DAY. It has won over 85 awards for national and international tourism, outstanding architectural quality and engineering achievement. In fact, it has become the UK’s most popular paid-for visitor attraction. Treat your little bunnies to a special Hotel Chocolat Tasting Eggs-Travaganza! From first dates to couples saying “Eye do”, be a part of the journey into London’s Skyline this February. Check out the London Eye's new series of events, in partnership with Time Out.